Here you can find latest update regarding PEEF Secondary Level Special Quota Scholarship 2018. PEEF has announced Secondary level Special Quota Scholarship for the year 2018-19. This scholarship is for those students who have passed their 8th class and now they are enrolled in 9th class. Children of Government Employees of grade 1 to grade 4. Children of those civilians whose died in terrorist attacks. Students who relate to one of above mentioned categories, are eligible to apply for scholarship. Download PEEF Secondary Level Special Quota Scholarship application form from this link. 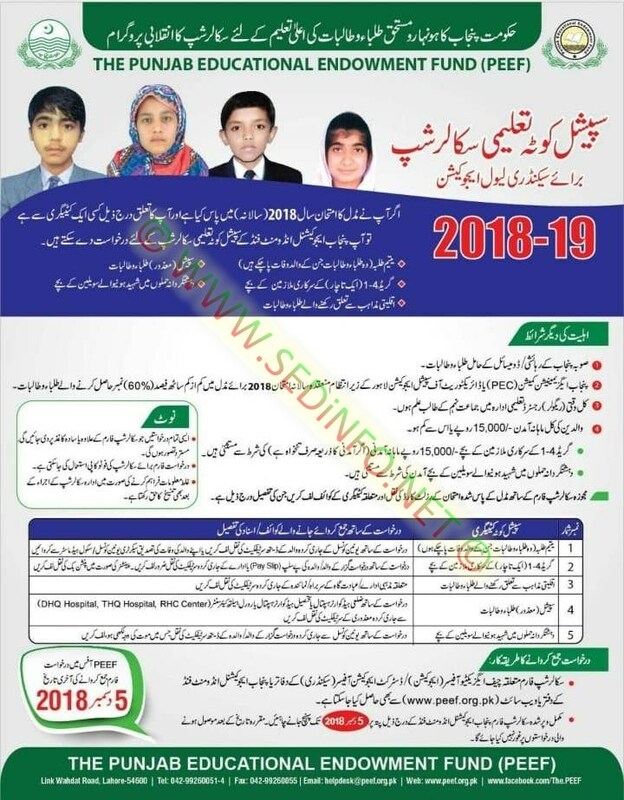 You can get PEEF Secondary level special quota scholarship form from Chief Executive Officer (CEO) Education or District Education Officer (Secondary). You can also get PEEF secondary level special quota scholarship form from Punjab Education Endowment Fund office. Completely fill application form and post this form on this address; “THE PUNJAB EDUCATIONAL ENDOWMENT FUND (PEEF), LINK WAHADAT ROAD, LAHORE-54600. Last Date for Application submission is December 5, 2018. For more details about PEEF Secondary Level Special Quota Scholarship, 2018, Check uploaded advertisement. Tags: 9th class peef scholarships, 8th class scholarships, matric scholarships, matric peef scholarships. Download PEEF Graduation Special Quota Scholarship Application Form Here you can Download PEEF Graduation Special Quota Scholarship Application Form. PPEF has announced Graduation Special Quota Scholarship. Get latest scholarship updates here on this link.